In the structural firefighting environment, occurrence of flashover (particularly while firefighters are operating inside the compartment) fits substantially with the description of extreme used by wildland firefighters. Ontology may be described as definition of a formal representation of concepts and the relationships between those concepts. An ontology provides a shared vocabulary. Unfortunately we do not have a well developed ontology of fire behavior phenomenon and many types of phenomena have more than one definition. As with the use of the word extreme, there is some debate about the need to classify phenomena as being this or that (e.g., flashover or backdraft). I take the position that it is useful (but difficult as we do not have a common classification scheme or ontology). But, I think that it is still worth the effort. This is a substantive topic for a later post. This post will examine a type of fire gas ignition phenomena that has been involved in a number of incidents in recent years resulting in near misses, injuries, and fatalities. In a previous post, I posed the question: Backdraft or Smoke Explosion?. This post used a video clip to open a discussion of the difference between these two phenomena. A smoke (or fire gas) explosion is a type of fire gas ignition, but there are a number of other types of fire gas ignition that present a hazard during firefighting operations. All fire gas ignitions (FGI) involve combustion of accumulated unburned pyrolysis products and flammable products of incomplete combustion existing in or transported into a flammable state (Grimwood, Hartin, McDonough, & Raffel, 2005). In a smoke explosion, ignition of a confined mass of smoke gases and air that fall within the flammable range results in extremely rapid combustion (deflagration), producing an significant overpressure which can result in structural damage. However, what happens if the mass of gas phase fuel is not pre-mixed within its flammable range and does not burn explosively? The general term Fire Gas Ignition, encompasses a number of phenomena that are related by the common characteristic that they involve rapid combustion of gas phase fuel consisting of pyrolizate and unburned products of incomplete combustion that are in or are transported into a flammable state. For now, let’s differentiate these phenomena from backdraft on the basis of the concentration of gas phase fuel (backdraft involving a higher concentration than fire gas ignition). Fire gas ignition can involve explosive combustion (as in a smoke explosion) or rapid combustion that does not produce the same type of overpressure as an explosion. One such phenomenon is a flash fire. In this case, gas phase fuel ignites and burns for short duration, but does not release sufficient energy for the fire to transition to a fully developed stage (as occurs in flashover). While a flash fire may not result in flashover, the energy release is still significant and heat flux (energy transferred) can be sufficient result in damage to personal protective equipment, injury and death. This post uses a case study to examine the flash fire phenomenon. 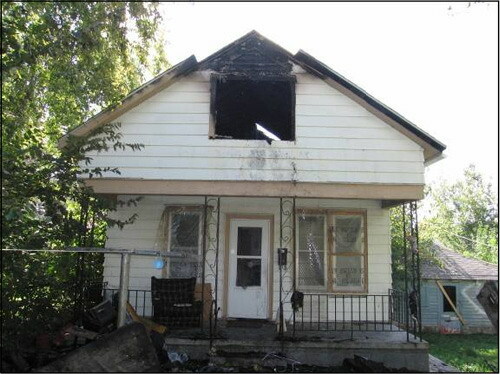 This case study is based on a near-miss incident involving extreme fire behavior during a residential fire that occurred on October 9, 2007 at 1119 William Street in Omaha, Nebraska. Special thanks to Captain Shane Hunter (Omaha Fire Department Training Officer) for sharing this post incident analysis and lessons learned. Unlike many of the incidents used as case studies, no one died or was injured during incident operations. In this near miss incident, the firefighters and officers involved escaped without injury, but the outcome could easily have been quite different. Weather was typical for early fall with a light breeze from the south (blowing towards Side C of the fire building). 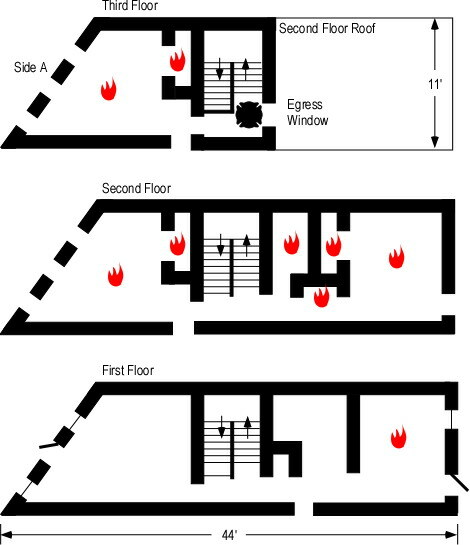 The fire building was a one and a half story, wood frame dwelling with a basement (see Figure 1). The attic space had been renovated into three separate compartments to provide additional living space. 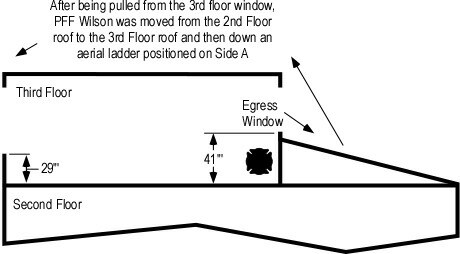 When the first company arrived they observed fire and smoke from the second floor window (see Figure 1) and reported a working fire. The doors and windows on the first floor were closed. What initial actions were taken? A 200′ hoseline was extended through the door located on Side A and through the living room and kitchen to the stairway to the second floor, which was located at the C/D corner of the structure (Figures 2 and 3). What did the fire attack crew observe? The living room and kitchen were clear of smoke and the door to the second floor stairway was closed. When this door was opened and the line was advanced up the stairway to the second floor, the company assigned to fire attack encountered smoke down to floor level on the second floor. Making a left turn at the top of the stairs (see Figure 4) the Captain noted high temperature at the floor level and observed rollover at the ceiling level. How did the ventilation profile change when the door to second floor stairway was opened? How might this have changed fire behavior? What did the depth of the hot gas layer (from ceiling to floor) indicate about the ventilation profile? What did rollover in the center compartment indicate? The Captain instructed the nozzle operator to apply water to the ceiling. The firefighter on the nozzle applied water in a 30o fog pattern (continuous application). Simultaneously, a crew working on the exterior vented the second floor window on Side C (see Figures 4 and 6). How did conditions change? The engine company working on floor 2 heard an audible, whoosh as the hot gas layer ignited producing flames down to floor level. Operation of the hoseline (30o fog pattern) had no immediate effect. The Captain ordered the crew to retreat into the stairwell and continue water application. What extreme fire behavior phenomena occurred? What were the initiating events that caused this rapid fire progression? What action was taken? While the engine company operated from the stairwell, vertical ventilation was completed over the center compartment (see Figures 4 and 5). After the creation of an exhaust opening in the roof, conditions on floor 2 became tenable and the engine crew was able to knock the fire down within several minutes. Why did conditions improve quickly after the creation of a vertical exhaust opening? What tactical options might have prevented this near miss? Captain Shane Hunter observed that the initial fire attack crew viewed this incident as an easy job. They thought that an attack from the unburned side would simply push the fire out the window where fire was initially showing on Side A. Why did things turn out so differently than anticipated? In his analysis of this incident, Captain Hunter points out that there is a considerable difference between a “self-vented” fire and an adequately ventilated fire. As discussed in the April 2008 Officer’s Corner (GFES), horizontally ventilated fires are likely to remain ventilation-controlled. It is important to read the Building, Smoke, Air Track, Heat, and Flame (B-SAHF) indicators to determine the current burning regime (fuel or ventilation-controlled) and anticipate the effect of changes to the ventilation profile. The fire in the compartment of origin reached flashover resulting in the extension of flames into the center compartment as evidenced by the observation of rollover by the Captain of the engine company performing fire attack. However, the center compartment and the compartment on Side C did not experience flashover (note the condition of contents in the center compartment in Figure 6.). If flashover did not occur in these two compartments, what happened? In this incident, the fire gases ignited in a flash fire, but combustion did not rapidly transition to a fully developed state in the two compartments adjacent to the compartment of origin. A flash fire rapidly increases heat release rate, temperature within the compartment and heat flux (as experienced by the fire attack crew in this incident). Like rollover, this phenomenon should not be confused with flashover as fuel in the lower region of the compartment may or may not ignite and sustain combustion. However, fire gas ignition can precede and precipitate flashover (should the fire quickly transition to the fully developed stage). The concentration of fuel within the hot gas layer varies considerably, with higher concentrations at the ceiling. Concentrations within the flammable range most commonly develop at the interface between the hot gas layer and the cooler air below. Isolated flames (an indicator of a ventilation-controlled fire) are most commonly seen in the lower region of the hot gas layer (as there may be insufficient oxygen concentration in the upper level of the hot gas layer to support flaming combustion). Mixing of the hot gas layer and air due to turbulence increases the likelihood of a significant fire gas ignition. What was the ventilation profile and air track when the engine company reached the top of the stairs to begin their attack on the fire? How did the tactical ventilation performed from the exterior (removal of the window on floor 2, Side C) influence the ventilation profile and air track? What effect do you think that continuous operation of the 30o fog stream had on conditions on floor 2? What combination of factors likely resulting in mixing of air and smoke (fuel) leading to the fire gas ignition that drove the fire attack crew off floor 2 and into the stairwell? This incident points to a number of key considerations and lessons learned. Beware the routine incident! Even what appears to be a simple fire in a small residential structure can present significant challenges and threats to your safety. Use the B-SAHF indicators to read the fire and consider both the stage of fire development and burning regime (fuel or ventilation-controlled) in strategic and tactical decision making. Flame showing is just that. Do not be lulled into a false sense of security by thinking that the fire is adequately ventilated. Read the air track indicators! Continue to read the fire after making entry. Smoke is fuel and hot gases overhead are a threat. Observation of isolated flames indicates a ventilation-controlled fire. Rollover often precedes flashover. Take proactive steps to mitigate the threat of extreme fire behavior. Recognize that ventilation-controlled fires will increase in heat release rate if additional air is introduced. Manage the ventilation profile using tactical ventilation and tactical anti-ventilation. Anticipate unplanned ventilation due to fire effects. Recognize that both horizontal and vertical ventilation are effective when used appropriately and coordinated with fire control. Consider the influence of inlet and exhaust opening location and size when anticipating the influence of tactical ventilation on fire behavior and conditions within the building. Again special thanks to Captain Shane Hunter and the Omaha Fire Department for sharing the information about this incident and their work to improve firefighter safety. Application of the B-SAHF (Building, Smoke, Air Track, Heat, &amp; Flame) organizing scheme for critical fire behavior indicators to photographs or video of structure fires provides an excellent opportunity to develop your knowledge of fire behavior and skill in reading the fire. While video provides the opportunity to observe fire behavior indicators over time, still photos also an excellent tool for practice your skill in reading the fire. This Reading the Fire exercise is based on a photo taken by Scott LaPrade, a firefighter assigned to Ladder 1 in Leominster, Massachusetts. Scott has been photographing fires around New England for 25 years. His website, Smoke Showing Photography is an excellent resource when looking for fire photos to practice reading the fire. On February 6, 2009, the Leominster Fire Department received a call for smoke in the building at 77 Cedar Street. Ladder 1 was first due and reported smoke showing from a three-story wood frame apartment building originally built in the 1900s. Initially light smoke was showing from the roof, but then appeared to dissipate. After companies made entry to investigate, the fire progressed rapidly. What stage(s) may the fire be in (incipient, growth, fully developed, or decay)? What burning regime is the fire likely to be in (fuel or ventilation controlled)? What conditions would you expect to find inside the doorway in the photo? What hazards does the firefighter in does the firefighter in the photo face while working in the doorway? How could these hazards be mitigated? If the fire is on Floor 1 (it was), what are likely avenues for extension in this type of building construction? Note the kink in the 1-3/4″ (45 mm) hoseline behind the firefighter. Kinks can dramatically reduce flow rate. Watch your hoseline as well as the B-SAHF indicators! Visit Scott’s website Smoke Showing Photography for additional photos of this incident and extend your practice in Reading the Fire. This is the first of a series of posts that will examine the events and circumstances surrounding the death of a Firefighter Paramedic Apprentice in Baltimore Maryland in 2007. Unfortunately many of the factors involved in this incident are not unique, but are common to many live fire training fatalities that have occurred over more than 25 years. Last Monday marked the second anniversary of the death of Firefighter Paramedic Apprentice Rachael Wilson. 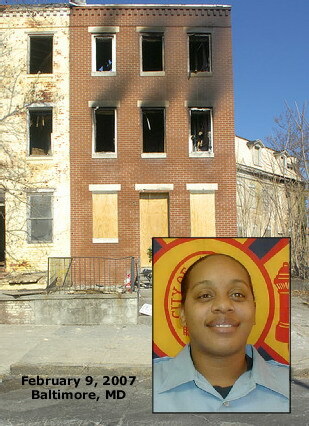 The death of this young mother in Baltimore, Maryland during live fire training on February 9, 2007 raised many questions. 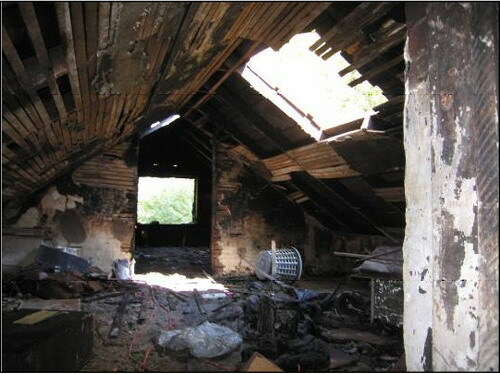 The investigations conducted by the Baltimore City Fire Department, an independent commission appointed by the Mayor of Baltimore (Shimer, 2007), and National Institute for Occupational Safety and Health (2008) determined that this training exercise was not conducted in compliance with National Fire Protection Association (NFPA) 1403 Standard on Live Fire Training in Structures (2002). �But does this answer the question of how this happened or why Rachael Wilson died? I contend that lack of compliance with existing standards provides only a partial answer. Two Firefighters Die in Fire Training Flashover – On January 26, two firefighters died from burns and smoke inhalation during a search and rescue drill held in a vacant single story building (Demers Associates, 1982, August). At first glance, the only difference between these two incidents is the month and day of occurrence. However, a major difference between these two tragic events is that the first occurred in Boulder, Colorado in 1982 while the second occurred 20 years later in Kissimmee, Florida in 2002. Five years later a similar story is repeated with the death of Firefighter Paramedic Apprentice Rachael Wilson. This comparison provides a dramatic example of the limited impact that existing live fire training policy has had on the safety of individuals participating in this essential training activity. This observation is not to minimize the important guidance provided by NFPA 1403 (2007), but to point to several limitations in the scope of this standard and examining this critical type of training activity simply from a reactive, rules based approach. A fire in a structure presents complex and dynamic challenges. Firefighters are faced with the need to protect the lives of the building occupants as well as their own while controlling the fire and protecting the uninvolved areas of the structure and its contents. Structure fires develop quickly requiring decision-making and action under extreme time pressure. These conditions require a high level of situational awareness and decision-making skill that is dependent on recognition of complex patterns of information presented by the fire environment (Klein, 1999; Klein, Orasanu, Calderwood, & Zsambok, 1995). Firefighters learn their craft through a mix of classroom and hands-on training. A majority of skills training is performed out of context (i.e. no smoke or fire) or in a simulated fire environment (i.e. using non-toxic smoke). However, this alone does not prepare firefighters to operate in the heat and smoke encountered in an actual structure fire nor to develop critical decision-making skills. Developing this type of expertise requires live fire training! Live fire training presents the same types of hazards encountered during emergency response operations. However, as a planned activity, training requires a higher standard of care to ensure the safety of participants. This is consistent with standard risk management practices in firefighting operations outlined by Chief Alan Brunacini (2002). We will risk our lives a lot, in a calculated manner to save savable lives. We will risk our lives a little, in a calculated manner to save savable property. We will not risk our lives at all for lives or property that are already lost. This perspective on risk management is commonly accepted throughout the fire service in the United States. Live fire training parallels the second element of the risk management profile: We will risk our lives a little in a calculated manner to develop competence in structural firefighting operations. In 1986, the National Fire Protection Association first published NFPA 1403 Standard on Live Fire Training. This important standard has been updated and revised five times since its inception. Often, revisions reflect the conditions and actions surrounding the deaths of firefighters during live fire training since the last revision. Detailed review of the latest revision of NFPA 1403 (National Fire Protection Association, 2007) shows little substantive change in areas that potentially have the most impact on firefighter safety. The 2007 edition of this standard prohibits location of fires in designated exit paths (a reasonable idea) and increases emphasis on the responsibility of the instructor-in-charge, stating: “It shall be the responsibility of the instructor-in-charge to coordinate overall acquired structure (or training structure) fireground activities to ensure correct levels of safety.” While this too is a reasonable idea, what exactly is the “correct level of safety” and how is the instructor-in-charge to coordinate this effort? NFPA 1403 (National Fire Protection Association, 2007) places specific emphasis on addressing unsafe acts and conditions directly connected to accidents that have occurred during live fire training (e.g., removal of low density fiberboard, prohibiting the use of flammable liquids except under specific conditions, prohibiting fires in exit paths and use of live victims). However, it does not explicitly address the primary causal factor influencing traumatic fatalities during live fire training. Most firefighters who die from traumatic injuries during live fire training die as a result of human error, often on the part of the individuals charged with ensuring their safety, the instructors. Reducing the risk of error requires both technical proficiency and competence in leadership, communication, and teamwork (i.e., crew resource management). Unfortunately many firefighters and fire officers have not heard of Firefighters Scott Smith and William Duran (Boulder Fire Department), Lieutenant� John Mickel and Firefighter Dallas Begg (Osceola County Fire-Rescue), and Rachael Wilson (Baltimore City Fire Department). In each of the incidents that resulted in firefighter fatalities during live fire training, those involved did not intend for it to happen. The purpose of live fire training is to develop the knowledge and skills necessary to safely and effectively engage in firefighting operations. Firefighters Scott Smith and William Duran died before the development of national consensus standards on safe practices for live fire training. In other cases the instructors and other participants were unaware of the standard or lacked detailed knowledge of how it should be applied. But in each case where firefighters were caught by rapid fire progress, they did not understand fire behavior and practical fire dynamics. Subsequent posts will examine the incident in which Rachael Wilson lost her life, the lessons that can be learned from live fire training fatalities, and action steps we can take to reduce the risk to participants while conducting realistic and effective live fire training. Brunacini, A. (2002). Fire command (2nd ed.). Quincy, MA: National Fire Protection Association. Klein, G. A. (1999). Sources of power. Cambridge, MA: MIT Press. Klein, G. A., Orasanu, J., Calderwood, R., & Zsambok, C., E. (Eds.). (1995). Decision making in action: Models and methods. Norwood, NJ: Ablex. National Fire Protection Association. (2007). Standard on live fire training. Quincy, MA: Author. Shimer, R. (2007) Independent investigation report: Baltimore city fire department live fire training exercise 145 South Calverton Road February 9, 2007. Baltimore, MD: City of Baltimore. The previous post (Shielded Fires) examined US Navy research on the effectiveness of different nozzle techniques when dealing with shielded fires conducted on the ex-USS Shadwell, the US Navy full scale damage control research facility (see Figure 1). 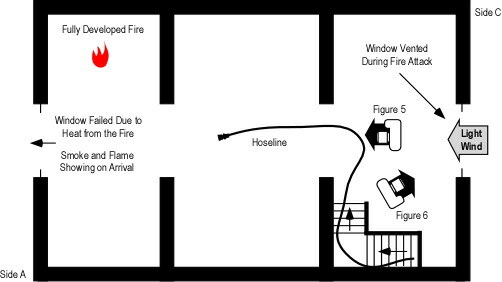 The researchers tested two different methods for controlling flaming combustion overhead while moving from the entry point to a location in a compartment where firefighters could make a direct attack on the seat of the fire. The first method involved use of a straight stream or narrow fog pattern and the second involved the use of a medium (60o) fog pattern directed upward at a 45o angle. In both cases, one to three second pulses were used in application of water into the hot gas layer. Analysis of this series of tests resulted in identification of a number of specific findings related to tactics, equipment, and training. Three of these findings were particularly relevant to the differences between straight stream/narrow fog and medium fog applied to control flaming combustion in the upper layer. Pulsed application with a medium fog pattern directed upward at a 45o angle resulted in less disruption of the thermal layer than use of a straight stream/narrow fog pattern. Use of a straight stream/narrow fog resulted in production of a large amount of steam. This was attributed to the fact that the hose streams had to be deflected compartment linings. Water management is important when controlling fire in the upper layer, particularly when using a straight stream/narrow fog. Excess water will only result in excess steam production. Discussing the findings, the researchers observed that pulsed application of medium fog appeared to be an effective tactic for controlling flaming combustion in the upper layer. This conclusion is supported by consistent reduction of upper layer temperature over the course of the tests involving use of pulsed application of a medium fog pattern.� Previous concerns that this approach would result disruption of thermal layering and excess steam production appeared to be unfounded. This conclusion is supported by the heat flux data at 0.9 M (7′ 10″) and 2.9 M (3′) above the floor. Disruption of thermal layering is indicated by an upward spike in lower level heat flux or equalization of heat flux at the lower and upper levels. Several questions about the outcome of these tests were posed at the end of the Shielded Fires post. Why did the application of water in a straight stream/narrow fog pattern fail to effectively control flaming combustion in the upper layer? Why did the upper layer temperature fluctuate when a straight stream/narrow fog was used? Why did the upper layer temperature drop consistently when a medium angle fog pattern was used? How did the heat flux measurements correlate with the upper layer temperatures in these two tests? What are the implications of the heat flux data recorded during these tests on tenability within the compartment for both firefighters and unprotected occupants? Water converted to steam on contact with compartment linings or other hot objects cools the surfaces. This indirectly lowers gas layer temperature as the hot gases will continue to transfer heat to compartment linings and other cooler objects in an attempt to equalize temperature. 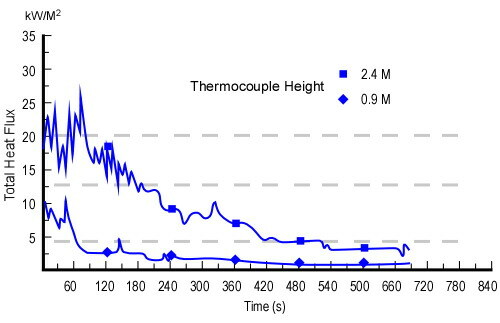 However, the effect on upper layer temperature is limited, minimizing effectiveness of stream application in controlling flaming combustion in the upper layer. In addition, as gas temperature is not significantly reduced, steam produced on contact with hot surfaces is added to the volume of hot gases, resulting in a less tenable environment. Ineffectiveness of straight stream/narrow fog attack in controlling flaming combustion in the upper layer and the perception of increased steam production with this type of attack likely have a common cause. Conversion of water to steam requires much more energy than simply heating water from ambient temperature to its boiling point. When water changes phase from liquid to gas (steam) while in the hot gas layer, the temperature of the gases is reduced. This has several consequences. First, sufficient reduction in temperature results in extinguishment of flaming combustion. 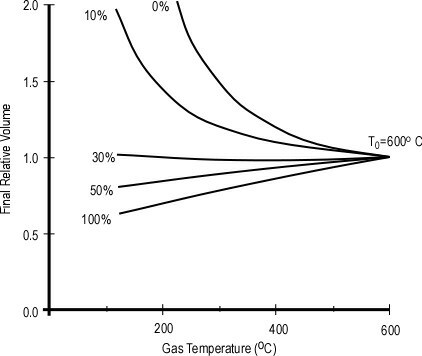 Second, reduction of gas layer temperature causes a proportional reduction in gas volume. As illustrated in Figure 2, if 35% of the water is truned to steam in the hot gas layer, the total volume of steam and hot fire gases is less than the original volume of hot fire gases alone (S�rdqvist, 2002). As this is often difficult to understand, I will provide a more detailed explanation of this in a subsequent post. Note. Adapted from Water and Other Extinguishing Agents (p. 155) by Stefan S�rdqvist, 2002, Karlstad, Sweden: Raddningsverket. Copyright 2002 by Stefan S�rdqvist and the Swedish Rescue Services Agency. Production of the same volume of steam can have far different consequences depending on where it is produced (in the hot gas layer versus on contact with hot surfaces! Total heat flux includes energy transferred through radiation, convection, and conduction. However, in these full scale fire tests, radiant and convective heat transfer was most significant. Radiant heat transfer is dependent on the temperature of upper layer gases and flaming combustion. Convective heat transfer is dependent on gas temperature, movement of hot gases, and moisture. Reduction in upper layer temperature while maintaining thermal layering minimizes total heat flux at the lower level where firefighters are working. These tests were conducted on a ship (see Figure 1) with most of the compartment linings being metal (rather than gypsum board, plaster, or wood as typically encountered in buildings. The fire compartment did not have windows or other ventilation openings that may exist in more typical buildings encountered by structural firefighters. These differences are significant, but do not diminish the importance of the results of these tests and findings by the researchers. These tests provide substantive evidence in support of the effectiveness of water converted to steam in the hot gas layer (as opposed to on surfaces) in controlling flaming combustion in the hot gas layer. However, this does not diminish the importance of direct application of water onto burning fuel in a direct attack to complete the process of extinguishment. S�rdqvist, S. (2002). Water and other extinguishing agents. Karlstad, Sweden: Swedish Rescue Services Agency. In Myth of the Self-Vented Fire I pointed out that every week represents the anniversary of the death of one or more firefighters as a result of extreme fire behavior. Some firefighters have heard about these incidents, but many have not. In an ongoing effort to encourage us to remember the lessons of the past and continue our study of fire behavior, I will occasionally be including brief narratives and links to NIOSH Death in the Line of Duty reports and other documentation in my posts. Firefighter King and Firefighter Lockhart responded on different companies to a report of a structural fire in a tire shop. No visible fire was encountered, there was no excessive heat, and only light smoke was found in most of the building with heavier smoke in the shop area. Ten firefighters were in the interior of the structure when an event that has been described as a flashover or backdraft occurred. The firefighters were disoriented by the effects of the backdraft. Some were able to escape but Firefighter King and Firefighter Lockhart were trapped in the structure. A garage door that self-operated due to fire exposure may have introduced oxygen into the fire area and may have been a factor in the backdraft. The exit efforts of firefighters were complicated by congestion in the building. Within minutes of the backdraft, the building was completely involved in fire and rescue efforts were impossible. Both firefighters died from carbon monoxide poisoning due to inhalation of smoke and soot. Further information related to this incident can be found in NIOSH Fire Fighter Fatality Investigation 98-F-05. Firefighter Wilson and the members of her fire academy class were attending a live fire training exercise in a vacant rowhouse in Baltimore. Firefighter Wilson was assigned to a group of apprentices and an instructor designated as Engine 1. Her group advanced a dry attack line into the structure. As they climbed the stairs, the line was charged. Engine 1 encountered and extinguished fire on the second floor but did not check the rest of the second floor for fire prior to proceeding to the third floor. On the third floor, they again encountered and began to extinguish fire. Fire conditions began to worsen with a marked increase in smoke and heat that appeared to be coming from the second floor. Engine 1 firefighters who were on the stairs began to receive burns from the fire conditions. The instructor for Engine 1 climbed out a window at the top of the stairs and helped one burned firefighter escape to the roof. Firefighter Wilson appeared at the window in obvious distress and attempted to escape. The windowsill was unusually high (41 inches) and she was unable to escape. Firefighter Wilson momentarily moved away from the window, at which time she advised other firefighters to go down the stairs to escape. When she returned to the window, her SCBA facepiece was off and she was beginning to receive burns. She was able to get her upper body out of the window but she could not make it through. Firefighters on the exterior were unable to pull her through until firefighters were able to gain access on the interior and assist with the effort. When Firefighter Wilson was pulled to the roof, she was in full cardiac and respiratory arrest. She was immediately removed from the roof and received advanced life support care and transportation to the hospital. She was pronounced dead at 1250 hours. Firefighter Wilson received total body surface burns of 50 percent. The cause of death was listed as thermal burns and asphyxiation. Further information related to this incident can be found in NIOSH Firefighter Fatality Investigation F2007-09 and the Independent Investigation Report on the Baltimore City Fire Department Live Fire Training Exercise, 145 South Calverton Road, February 9, 2007. My next post will examine the incident in which Rachael Wilson lost her life in greater detail. Fire control and extinguishment is a fairly straightforward process when water can be applied directly to the burning fuel. In the case of burning ordinary combustibles, the energy required to heat the water to its boiling point and convert it to steam cannot be used to continue the process of pyrolysis and lowers fuel temperature to the point where the fire goes out. However, this process is complicated when the fire is shielded from direct application of water. Assuming that an offensive strategy is appropriate, there are several options for attacking a shielded fire: 1) Make an indirect attack from the exterior (assuming you can access the involved compartment(s) from an exterior location) or 2) Move inside the building to a point inside the building where a an indirect attack can be made from outside the involved compartment(s), or 3) Move inside to a location where a direct attack can be initiated. When adequate resources are available offensive attack from the interior addresses both life safety and fire control priorities. Proper hoseline placement and coordination of fire control and ventilation tactics protects civilian occupants and provides a safer work environment for firefighters. The topic of fire stream selection (fog versus straight or solid stream) likely generates more energy than a fully developed compartment fire. Firefighters bring a great deal of passion based on experience, knowledge, and ignorance to the discussion. An effective fire stream puts the appropriate amount of water in the right form and right location to achieve the desired result. 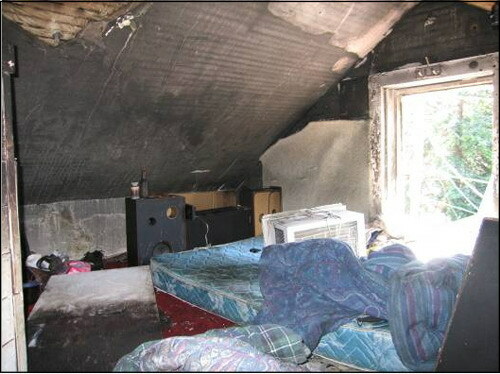 An efficient fire stream accomplishes this with the smallest volume of water and least water damage. Understanding the effectiveness and efficiency of fire stream application requires both qualitative and quantitative evidence. Firefighters can observe the effects of fire stream application and make a judgment as to effectiveness and efficiency. However, this understanding can be deepened by scientific examination that measures the impact of fire stream application methods. In 1994, the United States Navy conducted a series of tests to investigate the aggressive use of water fog for shipboard firefighting (Scheffey, Siegmann, Toomey, Williams, & Farley, 1997). 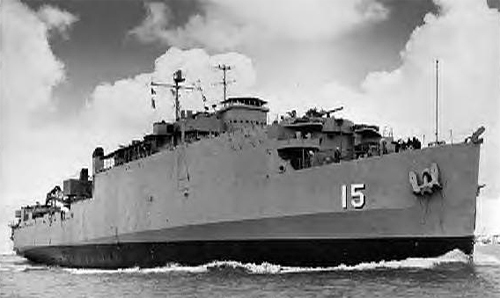 Prior to this time, shipboard firefighting either involved direct attack with a straight stream or narrow fog pattern or indirect attack from outside the involved compartment. This series of tests compared the use of pulsed application of a medium (60o) fog pattern with use of a straight stream in controlling shielded fires and fire conditions involving high temperature and thick smoke conditions that impeded location of the seat of the fire. The conditions (heat, smoke, and fire gases) associated with these fire scenarios typically does not prevent initial entry into the fire compartment. However, the extra time that it takes to maneuver within a space to locate and attack the seat of the fire does present a significant threat, primarily due to the stage of the fire. Uncontrolled, these fires may continue grow rapidly, potentially resulting in flashover conditions. This is particularly true where the fire is ventilation limited…and entry by the attack team introduces additional air [emphasis added]. 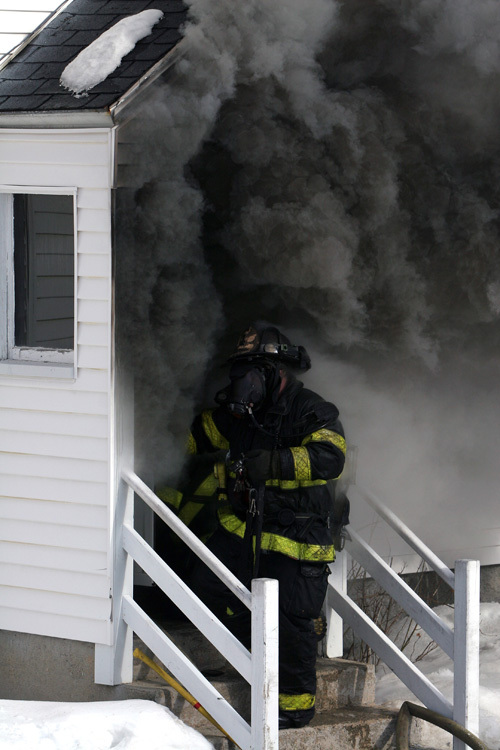 While the Navy is concerned with shipboard firefighting, ventilation controlled, shielded fires are commonly encountered by structural firefighters as well. The tests were conducted on the ex-USS Shadwell, the Navy’s full-scale damage control research and development platform and involved several different fire scenarios. This post will examine tests involving Fire Threat 1, a growth stage fire involving multiple fuel packages within a compartment to create a well developed growth stage fire approaching flashover (upper layer temperatures in the range of 400o-600o C (752o-1152o F)). In addition, obstructions were placed to preclude the possibility of direct attack from the point of entry. Firefighters were required to control flames in the upper layer in order to penetrate deep enough into the compartment to make a direct attack on the fire. Compartment Size and Configuration: The compartment used for the test was irregularly shaped (see Figure 2) with approximate dimensions of 8.5 M x 5.4 M (28′ x 17′ 7″) for an approximate floor area of 45.9 M2 (494 ft2). Fuel Load: Varied fuel types, including wood (red oak) cribs of varied dimensions, 1200 mm x 2400 mm (4′ x 8′) sheets of particle board (two layers of 6.4 mm particle board nailed together to provide a thickness of 13 mm (0.5″), and cardboard boxes of crumpled newspaper. All of the boxes were 457 mm x 381 mm x 305 mm (18″ x 15″ x 12″) and were taped closed after being loosely filled with newspaper. These fuel packages were distributed between three separate fire areas see (Figure 1). Fire Area 1 included a triangular wood crib, three particleboard panels (placed vertically against the compartment walls), and nine cardboard boxes filled with newspaper. Fire in these fuel packages was initiated using 2.8 L (0.5 gallon) of heptanes in a 610 mm (24″) pan. Fire Area 2 included a square wood crib and nine cardboard boxes filled with newspaper. Fire in these fuel packages was initiated using 18.9 L (5 gallons) of heptanes in a 914 mm (36″) square pan. Fire area 3 included a rectangular wood crib and three particleboard panels (placed vertically against the compartment walls). Fire in these fuel packages was initiated using 2.8 L (0.5 gallon) of heptanes in a 610 mm (24″) pan. 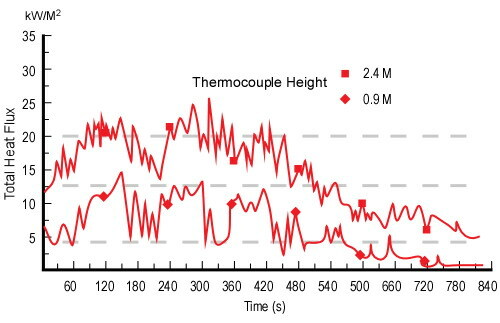 Ventilation Profile: Temperature in the upper layer was monitored using thermocouples. Watertight Doors 2-22-2 and 2-21-2 were used to control the air supply to the fire and maintain consistent temperature conditions and flaming combustion in the hot gas layer for each test. 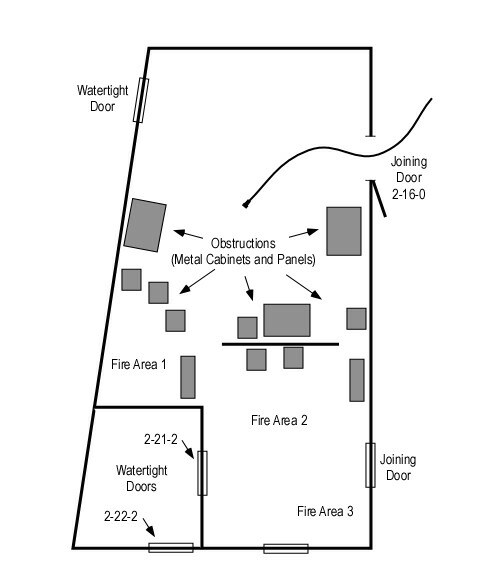 When the attack team entered the compartment, air also entered the fire compartment through the entry point at Joining Door 2-16-0 (see Figure 1). Tactical ventilation was not used in coordination with fire attack during these evolutions. The only ventilation provided while the attack team was engaged in firefighting operations involved the entry point as both exhaust and inlet opening. Fire Control Procedures: In each of the tests the fire attack team used a 38 mm (1.5″) hoseline with a combination nozzle delivering 360 L/min (95 gpm) at 700 kPa (100 psi). For the pulsed water fog attack, the nozzle team applied oneto three second pulses with a 60o fog pattern directed upward at a 45o angle.� For the straight stream attack, the tactics were the same, but a straight stream or narrow fog pattern was used. Test 14 was performed using traditional straight stream tactics. The nozzle operator applied two pulses with a narrow fog pattern in an attempt to control fire in upper layer. This water application produced a large amount of steam, but failed to control flaming combustion in the hot gases. After application of three more short pulses, the attack team moved to Fire Area 2 (see Figure 1) and commenced a direct attack on the fire in Fire Areas 2 and 3. However, 150 seconds (2 minutes 30 seconds) after commencing fire attack, the fire in Fire Area 1 reignited and flaming combustion in the hot gas layer caused the attack team to withdraw towards the entry point and attempt to regain control of the overhead fire. This was unsuccessful and the attack team withdrew to the entry point. A second attempt was made to enter and control the fire overhead using three long (five second) straight stream application from the doorway. These had minimal effect with continued flaming combustion overhead and involvement of fuel packages in all three fire areas. 420 seconds (seven minutes) after the initial attack, the evolution was terminated. Test 17 replicated conditions used in Test 14, but pulsed application of a medium (60o) fog pattern was used to control fire in the upper layer, rather than a narrow fog/straight stream. Immediately after making entry, the nozzle operator applied three short pulses directed upward at a 45o Angle in the direction of Fire Area 2. 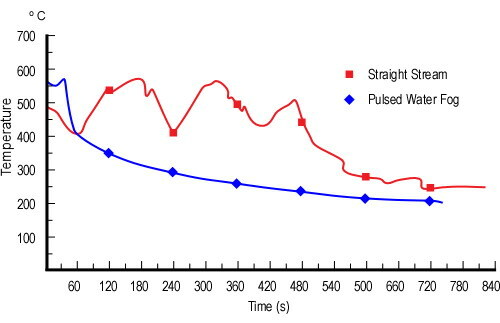 The first pulse appeared to cause the flaming combustion to increase in Fire Area 2, but subsequent pulses controlled flaming combustion overhead. Visibility was reduced slightly, but the attack team was able to advance and make a direct attack on the seat of the fire. The fuel packages in Fire Area 1 reignited, but the fire was quickly controlled. Quantitative data on factors such as upper level temperature and heat flux (heat transfer per unit area) within the compartment were recorded in addition to qualitative observations by the firefighters and researchers involved in the test. Figure 2 illustrates the temperature changes in the fire compartment during Tests 14 (straight stream/narrow fog) and 17 (medium angle fog) attacks. Total heat flux (e.g., radiant and convective) was recorded 2.4 M (7′ 10″) and 0.9 M (3′) above the floor. Figures 3 and 4 illustrate conditions recorded during Test 14 (straight stream/narrow fog) and Test 17 (medium angle fog). The dashed gray lines are provided as a point of reference at 20 kW/m2, 12.5 kW/m2, and 4.5 kW/m2. These correspond to heat flux conditions required for rapid auto ignition of ordinary combustibles, sufficient pyrolysis for piloted ignition of ordinary combustibles, and second degree burns to exposed skin within 30 seconds respectively. My next post will examine the answers to these questions and the conclusions reached by the Navy researchers as a result of this series of tests. Application of the B-SAHF (Building, Smoke, Air Track, Heat, & Flame) organizing scheme for critical fire behavior indicators to photographs or video of structure fires provides an excellent opportunity to develop your knowledge of fire behavior and skill in reading the fire. As you complete this Reading the Fire exercise, think about what you saw and what you did not see. Did you recognize developing conditions, what might you have missed? Watch the video several times. Remember that deliberate practice is focused on continuous improvement and requires repetition of critical skills. Where do you think the fire is located? What stage(s) of fire development is the fire likely to be in (incipient, growth, fully developed, or decay)? What changes in in fire behavior did you observe? What fire behavior phenomena occured? What changes in conditions were the likely cause? How could the crew on the hoseline have mitigated the hazards presented by this change in fire behavior? After completing the B-SAHF exercise, view the remainder of the video. Safe and effective fireground operations require that firefighters and officers are proficient at reading the fire and managing the fire environment. Developing proficiency requires ongoing deliberate practice. As discussed in previous posts, fuel and ventilation are the major controlling factors in compartment fire development. Compartment fires begin with the ignition of a single item. If energy is released at a sufficient rate, the fire will extend to other fuel and begin to influence the compartment environment. A single burning item or object exposed to heat transfer resulting from a fire is referred to as a fuel package. Fuel packages can be comprised of a single fuel (e.g., wood, plastic) or they may be composites of a number of different materials (e.g., upholstered chair, sofa, or mattress). This post will examine a familiar fuel package often involved in residential fires, the ordinary sofa. Upholstered furniture such as chairs, recliners, love seats and sofas are common fuel packages in the living room or family room of a residential occupancy. A single upholstered chair is likely to provide sufficient energy and heat release rate to take a 3.05 M x 3.66 M (10′ x 12′) room to flashover. A sofa on the other hand can provide three times the energy and heat release rate as a single chair. 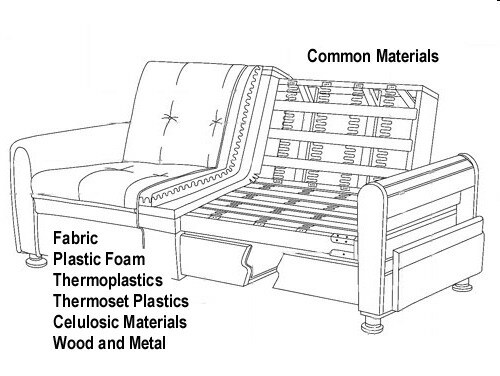 As illustrated in Figure 1, upholstered furniture such as a couch is a composite of a number of different materials, most of which are fuel. The frame is generally constructed of metal, wood or an engineered wood product such as plywood or particleboard. In older furniture, padding consisted of natural fiber materials, while modern furniture generally has some type of plastic foam padding. The upholstery can be natural fiber fabric or some type of synthetic material. Most of the synthetic materials used in furniture construction have more potential energy per unit mass (kg or lb) than wood or natural fiber padding and fabric. Open flame, smoldering combustion (e.g., carelessly discarded cigarette), or hot objects (e.g., portable heater) can provide sufficient energy to ignite upholstered furniture. Smoldering combustion can progress slowly through layers of material, resulting in a large quantity of toxic and flammable products of incomplete combustion and may even self-extinguish. However, if smoldering combustion reaches the edge or surface, or if the initial ignition resulted in flaming combustion, the fire may transition rapidly from an incipient to growth stage fire. Given an adequate supply of oxygen heat release rate is dependent on fuel type(s) and geometry. 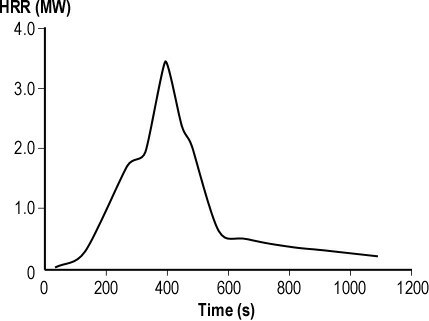 For example, the heat release rate (HRR) from a burning sofa can quickly reach as high as 3 MW as illustrated in Figure 2. This is easily enough to result in extension to other fuel packages and result in rapid transition from the growth stage to a fully developed fire in the compartment (flashover). This HRR curve was adapted from National Institute for Standards and Technology (NIST) tests of fuel packages. Phographs, video, and detailed test data are available on the NIST Building Fire Laboratory web site. 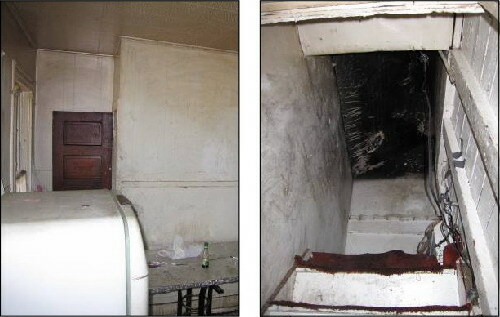 In many cases, the developing compartment fire becomes ventilation controlled and HRR is diminished, failing to reach the peak illustrated in Figure 2. When the fire becomes ventilation controlled, fuel continues to pyrolize, transitioning from solid to gas phase fuel in the smoke layer. If the compartment is tightly sealed, the fire may self-extinguish. However, an increase in ventilation (e.g., failure of a window or opening a door to gain access for firefighting operations) can result in a rapid increase in heat release rate, and potentially a transition to a fully developed fire (ventilation induced flashover). This post examined a common piece of furniture found in most residential occupancies. Consider that there are many others and that fuel packages can also include interior finish such as carpet and structural materials. Wildland firefighters are well aware of the hazards presented by different fuel models, structural firefighters should consider the types of “fuel model” presented by different types and configurations of contents and structural materials in the built environment.